The first salt produced in what is now the United States was made, of course, by native people, though in many cases we don’t know the particular techniques used. Spanish explorer Hernando de Soto observed people living along the Mississippi Delta boiling brine they made from salt dried on the sand. Avery Island, nestled in the Louisiana bayou, is home to the oldest known saltworks in North America – the people living there used broken pottery, some of which is carbon dated to 2500 BCE, to make salt. Along the East Coast, salt and the colonization of the eastern seaboard went hand in hand. English sailors made their first regular trips there not to settle, but to fish. And explorers Lewis and Clark became the first known men to produce salt on the West Coast during their epic expedition of the early 19thcentury. Today, we’re seeing a resurgence of new American saltmakers, making salt much in the same way that makers did centuries ago. From Mendocino, California, to Hawaii, from rooftops in New York City to the small island of Martha’s Vineyard off the coast of Cape Cod in Massachusetts. Martha’s Vineyard Sea Salt, a fairly new venture from husband and wife team Curtis Friedman and Heidi Feldman, gets its unique mineral richness from the waters surrounding the Atlantic Ocean island. Vineyard residents Heidi and Curtis, a tech consultant and carpenter who started Down Island Farm on their Tisbury property, started researching sea salt a few years ago and formally launched theirs in the spring of 2013. Martha’s Vineyard Sea Salt revives a lost tradition on the island, which, like many places in New England, has a long, storied history in salt. As far back as the late-1600s, colonial settlers began to produce sea salt on Martha’s Vineyard, also referred to as Noepe by the Native American Wampanoag tribe. Residents of the Vineyard used sea salt to preserve and season food and tan animal hides, all extremely critical to survival. By 1807, salt manufacturing was the island’s second largest industry, but it declined after the War of 1812 when large, industrial companies began popping up along the coast. Since that time, a few Islanders have produced sea salt for personal and even restaurant use, but none have attempted to reintroduce 100% natural sea salt. 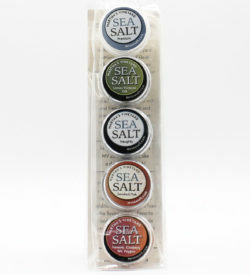 Martha’s Vineyard Sea Salt is the first known saltworks on the Vineyard to produce sea salt commercially since the 1800s. Heidi and Curtis use a deceptively simple evaporation process to produce their salt. Every few weeks, they pump sea water from the ocean into a plastic tank, drive it back to their farm, and funnel it into a 76-by-12 evaporator Curtis built on the outskirts of their property. Once the water is in, it’s just a matter of time – and sun. Slowly (but surely), most of the water evaporates until only residual salt granules are left. Heidi and Curtis then rake the salt crystals by hand and put them through a short dehydrator in small batches before packaging. This salt is an honest expression of the island itself: wet and rocky and a tad non-traditional. The couple seems intent to keep it that way. They’ve struck a beautiful balance, negotiating between climate, process, and history, letting the island do the work (with a pump or two at the beginning and a shake or two of the rake at the end). The resulting salt is one that’s fresh, briney, and abundant with minerals. . I use it on hearty meats, like beef and bison or on roasted vegetables, like potatoes with herbs, much like I would use a Sel Gris de L’Ile de Re or Pangasinan Star. I also like it mixed into hearty bean stews or chilis, or sprinkled on top of springy grain salads, like quinoa with apples, feta, scallions and a lemon vinaigrette. A pinch or two on rich, buttery baked goods like pretzels or crostatas is also wonderful. The secret of this new American salt is out: locals are going crazy about it, chefs can’t seem to sprinkle enough on their dishes, and media from half way around the world are knocking down the evaporator door to get their hands on some. And I happen to be over-the-moon about this American salt as well – the flavor of New England reverberating on the island, and across the country, stronger than ever.